With Postgres 11 looming on the near horizon, it’s only appropriate to check out a recent beta and kick the tires a few times. Whether it’s improvements in parallelism, partitions, stored procedures, JIT functionality, or any number of elements in the release page, there’s a lot to investigate. It just so happens that I ran across a fortuitous event on Twitter when deciding on an appropriate topic. Behold! Wait! No! That’s not what stored procedures are for! When confronted with such a blatant corruption of such a cool new feature, it’s only natural to question the wisdom of doing so. It is, after all, not a great idea to programatically consume transaction IDs. I said as much and moved on with life, certain the worst was over. Now, Magnus is infamous for two things: his technical acumen, and giddy malevolence. 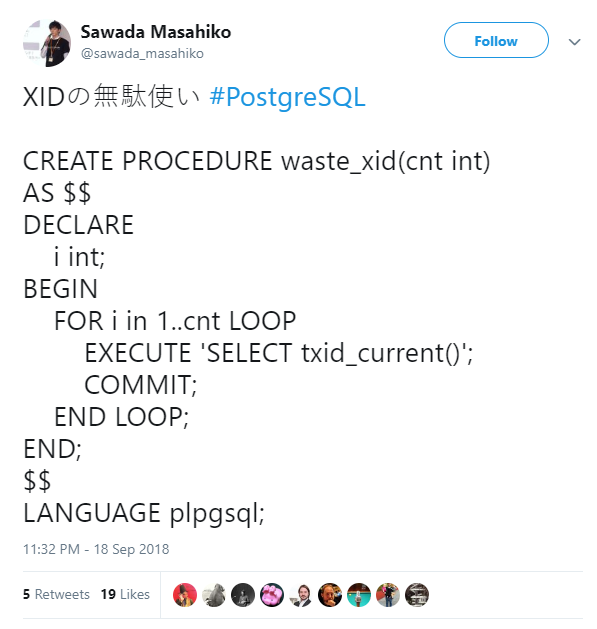 His advocacy of a stored procedure named “waste_xid” only proved nobody anywhere should ever run this anywhere, lest they immolate whatever system hosted the database instance. But hey, VMs are cheap; let’s break things. How else can we learn the limits of our new toys, but by virtually atomizing them? Before we saddle our poor innocent Postgres 11 installation with an inadvisable stored procedure designed specifically to underhandedly reap its transaction lifespan, we should probably make the routine as evil as possible. One thing stands out immediately: calling EXECUTE is unnecessary overhead. According to the information function documentation, txid_current will assign a new transaction ID if there isn’t one already. Since the stored procedure is constantly committing, that’s extremely handy. And since this is Pl/pgSQL, we can use direct assignment instead. Great! We can now waste XIDs about 4x faster than before! On this particular test VM, the maximum amount of wasted XIDs per second was about 125k. At that rate, we could blow through a billion in roughly two hours. Since quite a few installations use the default autovacuum settings, that means we could trigger a lot of vacuums at the 200M transaction mark in about half an hour. We didn’t need that disk throughput anyway. Regardless, what happens if we run it? Well, that was anticlimactic. How about the logs? We set our min_log_duration_statement to 100ms for debugging purposes, so we should definitely see a long call there. Here’s something that’s actually more interesting than it might appear at first glance. Stored procedures, it would seem, are atomic. We tested explicitly by adding a long pg_sleep call in the loop, and none of those entries were logged. Nope! Apparently CALL is only valid within its own context; no transactions for you. This could introduce interesting behavior in application layers that implicitly start a transaction before every command. The resulting error is a bit ambiguous however; why is the transaction termination invalid? Can’t it just say we can’t close the current transaction from within a procedure? So stored procedures are atomic, and can do whatever they want in their own transactional context. What else are they hiding? What are we testing for here? Well, one fundamental attribute of the now() function and several other related DATETIME routines, is that they are tied to the current transaction. So in theory, the value being returned should change. Uh oh. What does this actually mean? Is now() being tethered to the initial CALL instead of the current transaction? Or are PL/pgSQL transactions not real transactions? If they do operate in a different context than the outer transaction, how else does that context diverge? Or is this a bug? Postgres 11 is still in beta, after all. So in case you’d mentally linked the historical—and up until Postgres 11, current—syntax with the new stored procedure functionality, don’t. Procedures really did change more of the Postgres internals than a cursory examination could reveal. Now that we’ve kicked the proverbial tires and explored a few of the neat quirks stored procedures offer, what does it all mean? First and foremost, the ability to COMMIT or ROLLBACK within a function call allows both safeguarding activity batches or particularly critical data. No longer will one function call represent an all-or-nothing proposition. That alone is a massive enhancement to Postgres, one which users of other database engines such as Oracle have been clamoring for over the last 20 years. More subtly, it presents a new security concern that administrators should consider. The ability to manipulate transactions is a powerful lever ripe for abuse. At minimum, DBAs should consider revoking USAGE on any languages from users that shouldn’t be granted that capability. Users will still be able to invoke previously defined functions or procedures, but won’t be able to create new ones. In fact, this should probably be done on all current systems as a matter of course. Judiciously wielded, Postgres can continue runnin’ down the dream of becoming the best and most feature-laden database. We just need to pay attention to where we’re going. Uh, Sean, did you see the thread about advancing transaction_timestamp during commits within procedures? The behavior will change in PG 11 final. Thanks Shaun, that’s a very useful analysis of the not so salient aspects of the new procedure feature. You crack me up! Always funny, but informative, stuff from you. You go DUDE! First of all thanks for this post. It’s the best on this topic I’ve read so far. I have a question for you: is there a way to execute a procedure with transaction control using PSQL? According to the documentation, even with AUTOCOMMIT set to off, PSQL issues an implicit BEGIN just before any command that is not already in a transaction block and is not itself a BEGIN or other transaction-control command, nor a command that cannot be executed inside a transaction block such as VACUUM (unfortunately CALL is not treated in the same way as VACCUM). And, as you explained, the invalid transaction termination error happens because it is not possible to close the current transaction (initiated by PSQL) from within the procedure. In PostgreSQL 10 and older, all “procedures” are functions, and run in implicit transaction blocks.